I had the benefit of growing up with a wonderful grandmother who showered me with love and lots of homemade food. We always had at least two or three types of kimchi in the fridge. 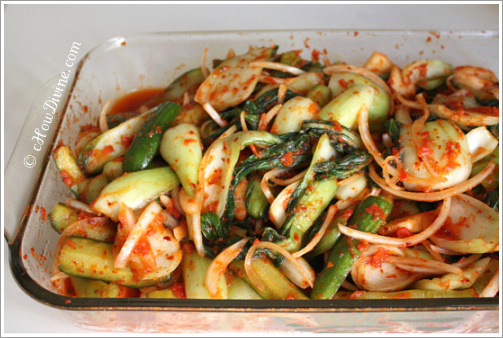 My grandmother was always in the kitchen whipping up different types of kimchi as well as other delectable dishes. She introduced me to many of the dishes I still enjoy as an adult. And whatever I wanted to eat, she was more than happy to cook. Some of our family members believed she was too indulging. Maybe she was, but her love wasn’t lost on me; I loved her back with all of my heart. She is no longer around. And I miss her. To many, kimchi is the pickled/fermented napa cabbage smothered in gochugaru (Korean red chili pepper flakes) that is almost always served in Korean restaurants. But there are many more varieties: oi sobaegi (cucumber kimchi), kkakdugi (radish kimchi), dongchimi (radish and napa cabbage in cold clear broth), chonggak kimchi (“ponytail” radish kimchi), etc. Some varieties don’t even use gochugaru, thus dispelling the myth that all kimchi must be spicy. Additionally, kimchi doesn’t have to be made with a particular type of cabbage or radish, increasing the variety even further. 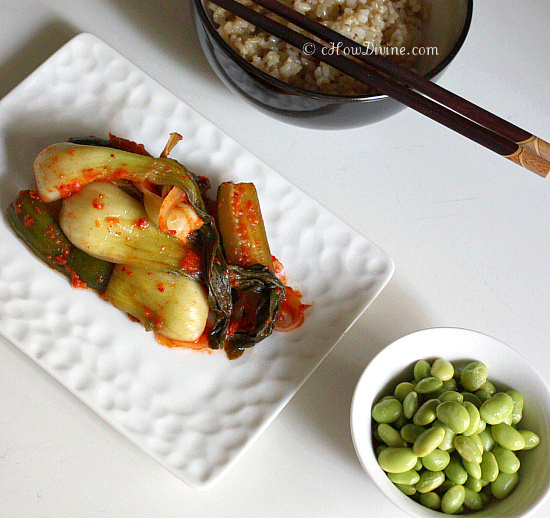 In fact, I made baby bok choy kimchi with cucumbers last weekend. It turned out really delicious. And I ate it the way my grandmother used to: wrapping a long piece of kimchi around some rice using chopsticks! I think my grandmother would approve. 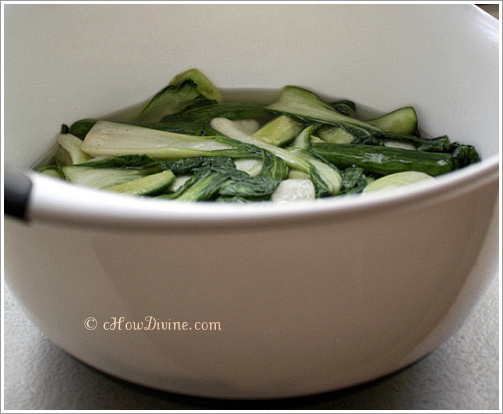 Wash bok choy in cold running water separating the leaves. 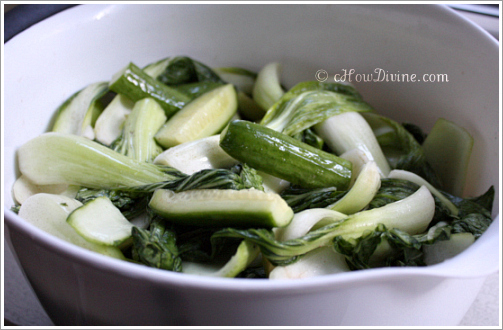 Cut up larger bok choy leaves into bite-sized pieces (1 1/2″ – 2″ pieces). Small leaves can be left whole. Meanwhile, finely chop/mince garlic, ginger, and jalapeños (if using). If you have a microplane, use it to finely grate ginger. It’s easier than finely mincing ginger with a knife. Place 1/2 onion, 1/2 peeled pear, and 1/4 peeled apple in a food processor or blender and puree until completely smooth. Loosely chop the red bell pepper. Place the chopped bell pepper in a food processor. Process the bell pepper until they take on the appearance and size of large pepper flakes. Add 1 TB salt and gochugaru to the bok choy and cucumbers. Mix well using your hands (use food-grade gloves). 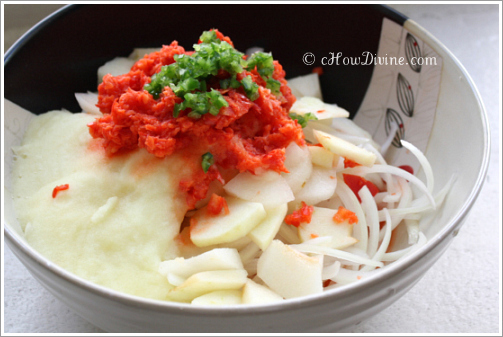 Add minced garlic, ginger, and jalapeños, processed bell pepper, pureed apple and pear, and fish sauce. Mix well until well incorporated. Pack the finished product into a big glass jar/container. Try to pack it tightly by pressing down as you are transferring it to the jar. Make sure all of the kimchi juice and bits are transferred. Leave some room at the top of the jar – about 2 inches should suffice. 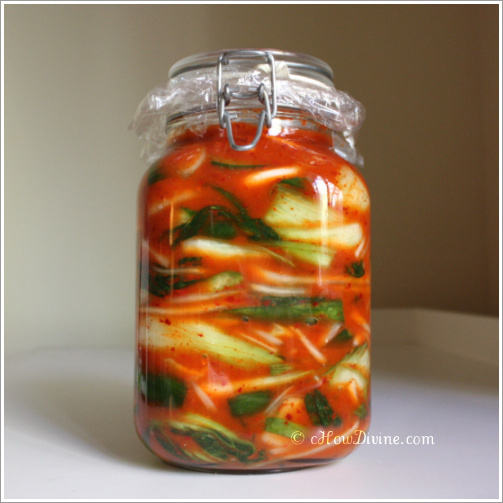 If you don’t leave some room, kimchi liquid will bubble over and make a mess as it ferments. Believe me, you don’t want that. Leave the jar out in room temperature for about 48 hours depending on the room temperature and preference. Refrigerate. Serve chilled. *If you choose not to use a red bell pepper, you need to ADD MORE gochugaru. However, adding a red bell pepper really make a difference in taste; it gives it a more refreshing taste. So if possible, try to use it. Thank you so very much for this – it’s utterly delicious! I had some for breakfast on a bowl of brown rice, and since then have stuck a fork in the jar pretty much every time I’ve walked by the office fridge. Steve suggested wrapping it in lettuce with some beef and brown rice, which sounds very tasty, but it’s so good just on its own I’m not sure any will make it home! You are so very welcome Emma! I’m so glad you like it. I’m always delighted to find people who love Korean food – especially kimchi. It’s an acquired taste. But once you are hooked, you become a lifer! I’ll be sure to send some more your way next time I’m making kimchi! I have a recent love of Korean foods and love most everything pickled and/or spicy; hence, my attraction to this preparation. That, and someone brought me a dozen large heads of green-stemmed bok choi. I am stumped as to what to do with it all and would like to adapt kimchi and other pickling techniques – any other suggestions to preserve bok choi? I don’t know how you feel about kimchi, as it is an acquired taste. If you do like it, try making kimchi with it. If you make a large batch, split them into two containers. Ferment one jar to your liking, probably 2-4 days at room temperature, then refrigerate. But refrigerate the other jar after about 1 day at room temperature. This will prolong the freshness of the kimchi in the second jar. Finish the fermented one first, while the second jar slowly ferments in the fridge! 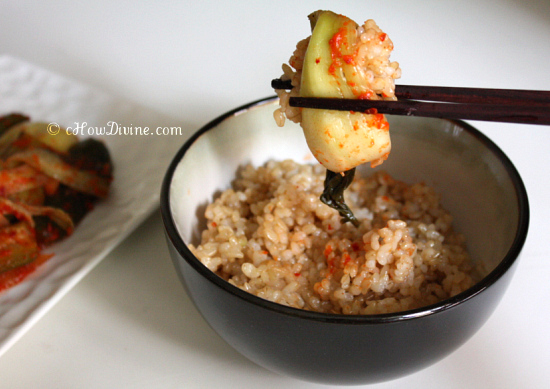 But if it does sour, you can always make kimchi stew or kimchi fried rice with it. So good! Thank you! I would not call me an “aficionado;” merely someone who was hooked at first bite. I am certainly happy with kimchi just as I am with all other spicy and/or pickled (lacto-fermented and otherwise) foods. Local farm gals just dropped off about 5 gallons of organic daikon – they are slated to be pickled with organic carrot, garlic, tumeric and some whole chiles. I can eat a pint of daikon pickles a day! Battling the flu here and with an abundance of winter greens, some of the bok choi wound up in a gumbo des herbes. The remainder will be used in your recipe above 😀 Thank you again and again! You’re so welcome Keith! I wish I had someone dropping off organic daikons at my doorstep! 🙂 They are so good braised with beef or black cod. Sorry to hear that you are battling the flu. I’m sure the gumbo des herbes was very comforting. Hope you feel better soon! I am so happy no one else in my house likes kimchi because your recipe for bok choy kimchi is TERRIFIC (= more for me)! I have had a big spoon dollop with each meal since the kimchi was finished! Thank you and sending wishes for a joyous new year! I’m so glad you enjoyed the kimchi. It is definitely an acquired taste. So I understand your family’s aversion to it. But once you get hooked, there’s no turning back! 🙂 I hope you get to try some of the other kimchi varieties. There are so many different varieties out there. Thank you Keith for sharing your experience and happy new year to you too! Can you leave this pickled in the jar for a month of more? Or would that be too overpowering of a taste? thanks! Kimchi must be refrigerated after it’s reached it’s desired ripeness. If you want to keep it for a longer period of time, you should put it in the refrigerator a little sooner than that. The flavor doesn’t get “stronger” per se, but it does get sour. And the sour kimchi is usually used for cooking. It’s actually much better than using young kimchi. So yes, if you put it in the fridge soon after it’s been put in a jar (maybe after a day? ), you should be able to eat it for a month or a little longer. Even in the fridge, it should “ripen” or ferment. It will just be at a slower pace. Remember to keep it in the coldest part of the fridge, in the back. Hope this helps! Thank you so much! Love Asian greens! 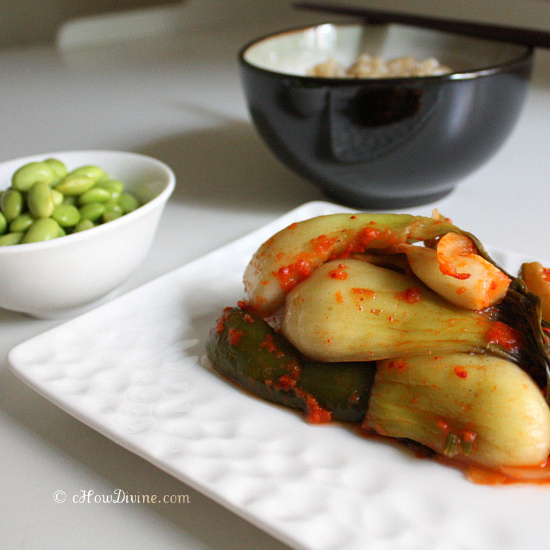 This is the Kimchi recipe I have been waiting for! This is going into my Krautsource today 🙂 thanks for the beautiful recipe. Thanks Ann! Hope you enjoy the kimchi.